At several points within its 441 mile Oregon route, the PCT rises to over 7,000 ft. in elevation. Here are six of the Pacific Crest Trail's high points, beginning in Southern Oregon and moving northward. Please e-mail me if you know of more! 1. Jackson Gap, near Dutchman's Peak in the Siskiyou Mountains. This location is just a few miles north of the California border. Nearby to the Gap is an even higher spot, which is one of the Oregon's remaining active fire lookouts. Click this link. 2. Devil's Peak shoulder in Southern Oregon at 7,300 ft. (old Skyline Trail route). See short story below, which includes thoughts inspired when I twice met Dr. Tom Hornbein of Mt. Everest Fame! 3. The shoulder of Mt. Thielson above Diamond Lake, at 7,410 ft.
4. The shoulder of Tipsoo Peak just north of Mt. Thielson and a bit SW of Miller Lake. At 7,570 ft, this is the highest point on the entire PCT within Oregon! ..It was part of the original 1920 Oregon Skyline Trail route, so it has been the highest point for a very, very long time....... Click Tipsoo link! Also links to big page on Mt. Thielson. 5. Park Butte crossing, 7,010 ft, just north of Mt. Jefferson and Jeff Park. The alternate branch of the PCT climbs very high as it rounds the eastern side of Mt. Hood. You leave the canyon bottom of Newton Creek at about 5430 ft, then climb steadily to reach this wind-blasted sign at around 7000 feet on Gnarl Ridge (aka Lamberson Butte, aka Lamberson Spur).... Then you ascend yet more, soon crossing a (near) permanent snow field and finally summiting at a tiny unnamed divide at about 7340 feet. This side of the mountain is the lee side in respect to winter storms, and is considerably drier and sunnier in its aspect than the cloudier, wetter south and west sides of Mt. Hood. PCT Luminaries, Heroes and Heroines- Do You know the answers? Who has hiked the PCT the fastest? Who has hiked/run the Oregon section of the PCT the fastest? Who was the first to complete the entire 2650 mile Pacific Crest Trail? Who was the first woman to complete the entire Trail? Who is often named as the "Father of the PCT?" The person named as the Father of the modern Pacific Northwest Trail? Answers at page bottom, click here. * derived from the June 2011 issue of the Pacific Crest Trail Communicator, the official magazine of the Pacific Crest Trail Association, based in Sacramento, California. The four 2013 speed records are from different sources. "Mountain Night on the Skyline Trail"
Devil's Peak was such a romantic name, my friends and I felt compelled to hike to the top! At 7,582 feet, the peak is the hub of the Seven Lakes Basin, a lake grouping that graces a remote region of the Oregon Cascades south of Crater Lake National Park. Our guidebooks told us that the Lakes Basin is one of the top five conglomerations of gorgeous mountain lakes in the entire state. The three of us were camped at Island Lake some 10 miles south of Devil's Peak when the urge to climb struck. It was mid-afternoon when we set out on our conquest, carrying little more than a couple of slim survival manuals*. We sweated upward in the failing light of the deep hemlock woods, immense choking clouds of mosquitos hot on our tails. To pause for rest was suicide - even slowing below a vigorous walk earned us new bites. Sure, we were dumb to be there in t-shirts and shorts, without a flashlight, our snacks long gone. But it was 1965 and we were in high school on our very first backpacking adventure. We'd at least had the wisdom to bring the books by our inspiring survival heroes, Wayne Winters and Bradford Angier. Just a day earlier we had gotten a trout by the Indian method - snaring it with our bare hands from a makeshift raft. The day before that we'd murdered a frog in a quiet meadow with a pocketknife, meat for our Miner's Lettuce stew. So with only our survival bibles and the hubris of immortal youth, we toiled upward into the night, praying our maps were correct and the looming peak was indeed far enough above timberline for us to escape those damned mosquitos. We reached the pass in that intermission between sunset and night. To the left lay a dimming Skyline Trail which would lead us up the dark bulk of Devil's Peak. We were teenagers - kids, really - nearly 10 miles from camp and woefully, yet blissfully, unprepared. So with youthful zeal we climbed and a few hundred feet below the summit, the incessant gray-droning mosquito hum mercifully ceased, to be replaced by a quiet purple twilight. In the rising high mountain night the stars were beginning to poke through, while behind the peak, the sky still glowed gold. But the sunset's arrival brought a cold that now nipped our heels, a new reason to hike harder. My two companions were little more than white shirts bobbing in the semi-darkness. We had a dim plan in mind, something to do with the Forest Service lookout tower on the summit, which we assumed would be manned. Suddenly, a man's voice broke through the dark, hailing us. It was the lookout, almost invisible in his Forest Service greens. He sat on a large, flat rock just below the summit, gazing at the quickly fading silhouette of Mt. McLoughlin to the south. I guessed he must be lonely living so deep in the wilderness under the high sky, not even a dog to share the hushed solitude. He guided us into his cramped 360-degree-windowed home, fired up the stove for heat, and soon we had hot soup and other snacks to slake our thirst and hunger. As a nearly-full moon rose over distant Klamath Lake, we found we'd been fortified by our warm rest, so we shrugged off the lookout's kind offer to stay until daybreak. We bandied about some talk of the moon guiding us home, theorizing how the strong moonlight would give just enough illumination for us to read our maps and to see the three or four crucial trail junctions along the way. I suppose we also may have been a little anxious to get back to Conrad, alone and waiting back at the camp. As we descended into the deep forest again, I, for one, had my doubts that we could negotiate the trails in the dark without becoming terminally lost. It was nearly 10 miles back to camp and though the lookout had equipped us with some Army K Rations, he hadn't had a flashlight to spare and only one extra flannel shirt to loan against the gathering chill. But as we sank fully into the forest's nighttime gloom, the first of the mosquitos materialized to help guide us home. * The booklet in the image is replete with great line drawings, has 76 pages, and was written by Wayne Winters, Copyright 1962 by Tombstone Nugget Publishing Co. 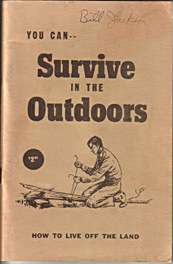 The Bradford Angier book mentioned is titled "How To Stay Alive In The Woods," 285 pages, copyright 1956, my edition by Collier Books, published 1962. Angier's book was originally titled "Living Off The Country." Link to another mountain story, "Windstorm on Mt. Shasta"
Link to my story "The Boulder of God"
Link to a natural world awakening story, "Dawning"
-- by Bruce B. Johnson M.A., Copyright 2009-2019, All Rights Reserved. Janet K. Hughes, Editor. In January 2004, after meeting famed Mt. Everest climber Dr. Tom Hornbein, I add this to my story: My story is really about Adventure and how it moves and shapes a person's life. It's very meaningful that I am able to remember that distant night in 1965 so vividly, so many years after its occurrence, and to remember it as a high point of my life, not as a disaster. It's been forty years since Dr. Hornbein's First Ascent of the West Ridge of Mt. Everest... He told us in his small audience that he's learned that the real adventures of life are often not the flashy, well-planned and expensive things, like his 1963 expedition to the Himalayas.... he's found that most of life's real adventures just happen, "just befall us." They're not planned, you just find yourself high on some lonely minor peak with dark coming down and no flashlight, and challenged to make the best of it. Can we take the mental turn of mind to recognize a chance for Adventure instead of seeing only problems and disasters? In November of 2013, I attended an event commemorating the West Ridge of Everest ascent by Tom Hornbein and Willi Unsoeldt. Almost 1,000 people were in the audience. Hornbein was there, as was Jim Whittaker. Tom's message was the same as I had heard him voice in 2004. 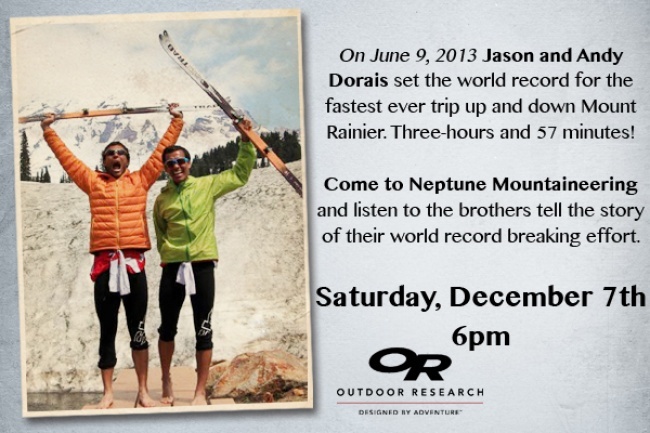 In November 2011, I attended a major presentation by this American climbing legend. Beckey's presentation at the University of Puget Sound drew a standing-room only crowd of well over 300. Many were young people. This led me to wonder at the man's truly remarkable Life and what about that Life is so inspirational to young people.... You can draw your own conclusions, but to me it must have something to do with the deep connections between the notion of Freedom and spirit of climbing (eg. the Mountaineer's ageless reference book, "Mountaineering, Freedom of the Hills")......Beckey's life seems to be that of a poster child for Freedom, individuality, self-determination, a life not tied down by a steady job or a marriage, high and free, living by the fruits of ones own efforts. In 1939, at age 15, Beckey accomplished a first ascent. It was to be the first of an almost uncountable number of first ascents in his 75 year-long climbing career. The peak was 7,292 ft. Mt. Despair in the glacier-shrouded North Cascades. He was in the company of REI Co-op's co-founder, Lloyd Anderson (link). 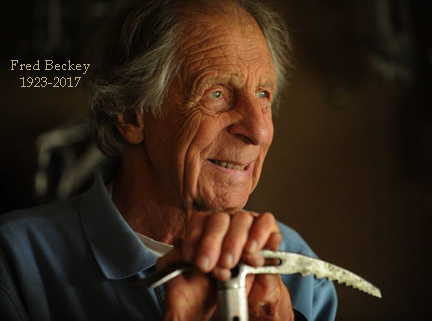 Beckey was a graduate of the Mountaineers climbing course, a teenager whose skills had stood out so much that older climbers like Anderson welcomed him on real climbs despite his age. Another very notable first was Beckey's 1946 first ascent of the imposing 9,007' Devil's Thumb in NW British Columbia. "The most famous feature on the Devils Thumb among climbers is its Northwest Face, rising 6,700 ft (2,042 m) from the Witches Cauldron at its base to the summit, at an average angle of 67 degrees. This is the biggest rock face in North America. The conditions prevalent also make it perhaps the most dangerous climbing proposition on the continent. The first ascent of the Devils Thumb was a landmark in North American mountaineering." (Wikipedia). 1954, Alaska: With many other first ascents in-between, 1954 found Beckey in Alaska, making three highly technical first ascents. The first ascent of Mt. Deborah (12,290), the first ascent of Mt. Hunter (14,573), and a new route on Mt. McKinley (20,310) called the Northwest Buttress to North Peak. Asked very late in his long career of innumerable high-standard climbs, which climb he was most proud of, Beckey said "Mt. Deborah." 1959 Yocum Ridge: the 36 year old Beckey became first to conqueror what was, and is, one of the most perilous routes on Oregon's highest peak, Mt. Hood, 11,245 ft. It's the notorious Yocum Ridge, climbed only in winter due to rockfall and icefall danger. 1963: there's an interesting story of why Beckey was turned down for the famous American expedition that put the first American on top of Everest (Big Jim Whittake). At the time, Beckey was clearly the most-storied climber in America. Why was he rejected? The 2004 Patagonia catalog featured a wry picture of Beckey, then aged about 81 (born in 1923)... He's wearing a T-shirt, with climbing rope over his shoulder and a climbing helmet. 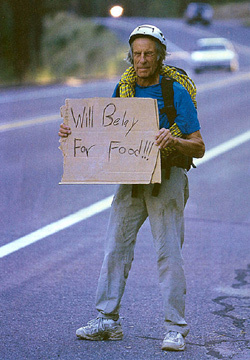 It's an urban roadside, he's holding a hand-lettered sign: "Will belay for food." Beckey's numerous climbing guides are justly revered; if you live in Washington State, for example, his three-volume "Cascade Alpine Guide" is a must-have reference (Mountaineers Books, 1973-2008). Fred passed away on Oct. 30, 2017, at age 94. My final Beckey picture is from a much younger time, probably in "The Valley" (Yosemite). 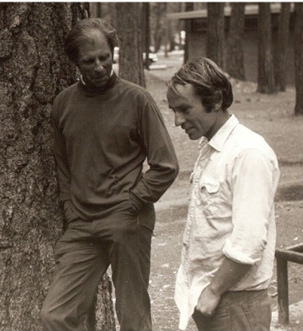 He's chatting with a very young Yvon Chouinard (Beckey on the left, Chouinard on the right). Yvon was Beckey's climbing partner on three of Beckey's innumerable first ascents; one in particular a super-hairy climb in 1961of 11,003' Mt. Edith Cavell in the Canadian Rockies. The new film "DIRTBAG" about Beckey's life is extremely well-done-- moving, inspirational and at times saddening (I've seen the film). I was very gladdened to learn that the always-publicity shy Beckey was honored late in his life by the Seattle Mountaineers with its very prestigious Lifetime Achievement Award (2015). Beckey was one of only four recipients in the 100 year history of the Mountaineers. Teddi Boston, a 49 year old mother, in 1976. "The Amelia Earhart" of the PCT. Below is a picture of a picture that appeared in the PCT Magazine in June 2011. 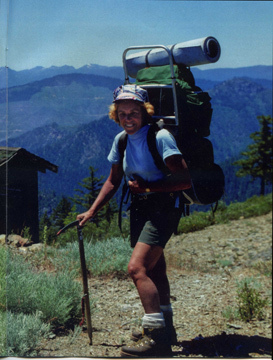 Note Ms. Boston's heavy leather mountain boots and huge frame pack, reminiscent of "Monster," the pack carried years later by Cheryl Strayed of "Wild" movie fame (starring Reese Witherspoon). Clinton C. Clarke is often named as the Father of the PCT. In 1935, he proposed the historic "Boy Scout Relay," wherein many teams of Scouts from California, Oregon and Washington hiked segments of the trail between 1935 and 1938, completing the entire Mexican border to Canadian border experience! The teams each carried the leather-bound "Pacific Crest Relay Log," which was passed from team to team and duly inscribed in by many writers in the course of their challenging journeys. Mr. Clarke, however, is not without competition, and there's a strong argument for naming Fred Cleator as the Father of the PCT. Here's a quotation from one of Cleator's 1920 trail journals, recorded near Summit Lake in the Oregon Cascades: "I am beginning to think that a Skyline Trail the full length of the Cascades in Washington & Oregon joining a similar trail in the Sierras of California would be a great tourist advertisement. For that matter it might be continued thru British Columbia and up the Alaska highlands. This is a future work but it would be fine to plan upon." - Fred Cleator, Field Diary, Aug. 1, 1920".... The article I found on NWHikers.net wrote, "...Cleator had joined the USFS in 1909, and in 1919 became the first Recreation Examiner (planner) for USFS Pacific Northwest Region 6. And plan he did, both the Skyline Trail in Oregon and Cascade Crest Trail in Washington, in extensive field trips, on horseback and on foot, from Lassen NP to Manning Park BC throughout the 1920s." Click to see portions of the first Skyline Trail map, 1921. Earl Schaffer, a man from Pennslyvania, hiked the entire AT in 1948. He traveled south to north and it took him 124 days. NEW Appalachian Trail SPEED RECORD, set in 2013 by Matt Kirk, an unsupported time of 58 days, 9 hours! Less than half the time of Earl Schaffer! THE TRIPLE CROWN: those few hikers who have completed all three major U.S. distance trails have hiked 7,925 miles. 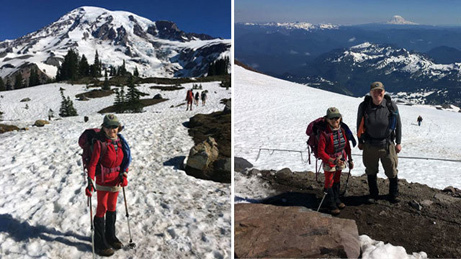 A 13 year old girl is the youngest known Person to complete all three trails, an incredible feat of strength, endurance and psychological fitness for anyone of any age, but especially for someone just barely a teenager! She began with completing the PCT in 2011, doing the Continental Divide Trail (CDT) in 2102, and then the Appalachian Trail in 2013. Her trail name is SUNSHINE. Her street name is Reed Gjonnes of Salem, Oregon.